It’s getting cool outside and the leaves are starting to turn. The kiddos are back in school and have resumed all of their after school activities…everyone is super busy. It makes it a little difficult to get a healthy, hearty meal on the table some nights. 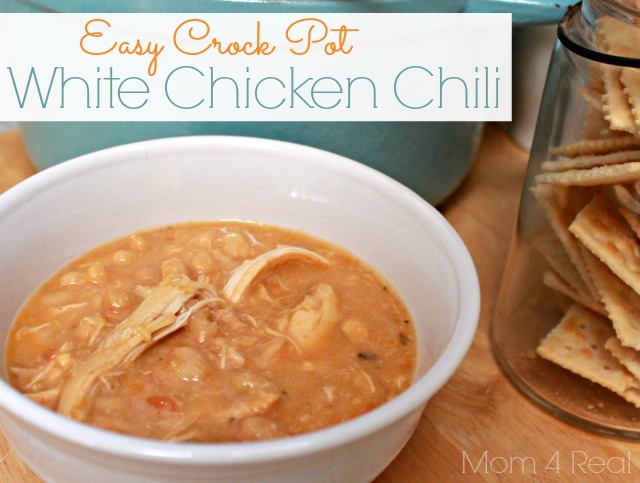 That’s when I turn to my family’s favorite, Easy Crock Pot White Chicken Chili. 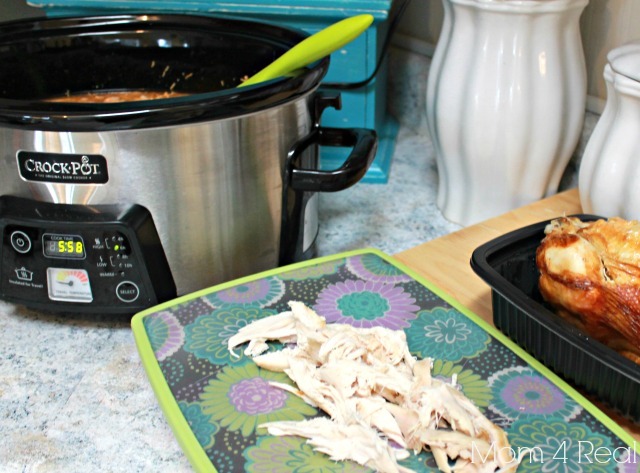 This recipe is so easy and all store bought…you can literally have this meal in the crock pot in less than 10 minutes, and let the crock pot do the work! This time I am making enough for my family as well as a neighbor who is having a difficult time right now. 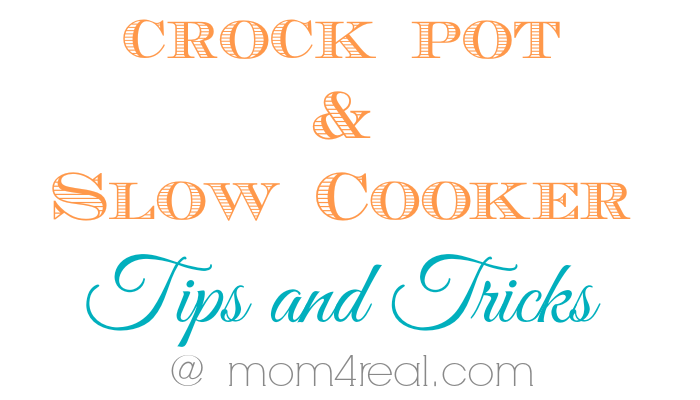 Add all ingredients to your crock pot or slow cooker. Cook on High for 6 hours or Low for 12 hours. Can serve with shredded cheese, sour cream, and crackers too. 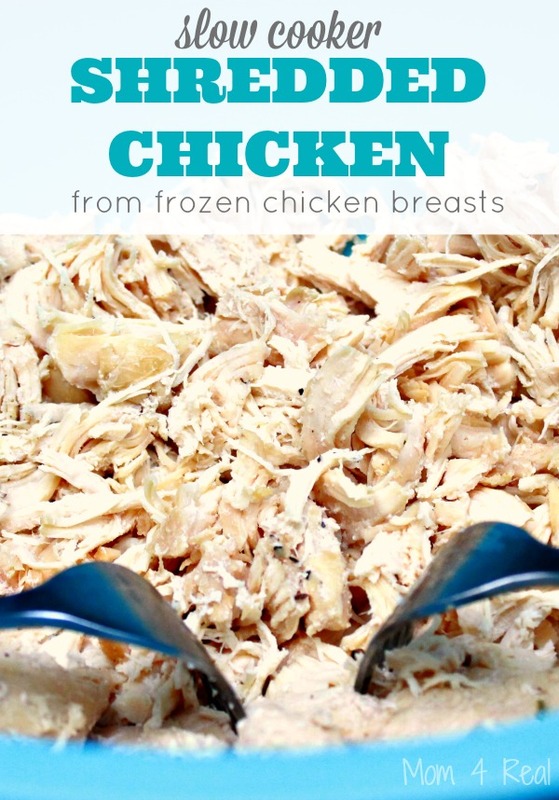 You can either use a store bought rotisserie chicken like the recipe calls for above, or make my Easy Shredded Crock Pot Chicken from Frozen Chicken Breasts that has TONS of flavor! I gather the ingredients in one spot…this is the best way to ensure you don’t leave anything out. 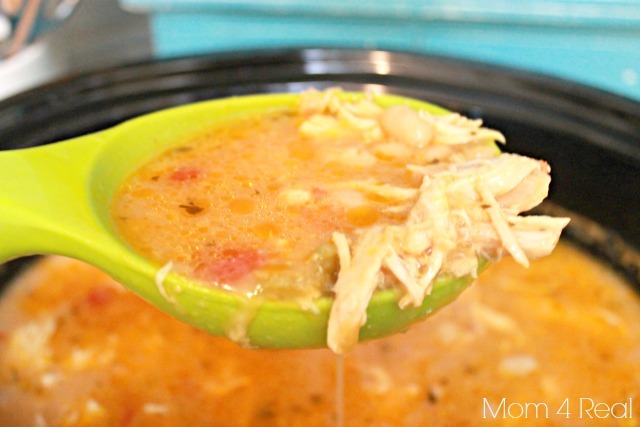 Shred your chicken and add all of your ingredients to the crock pot, then stir and put the lid on the crock pot. You can either cook on high for 6 hours or let your soup slow cook for up to 12 hours. It is seriously the easiest meal I make, and the kiddos love it…BONUS! You can serve your soup with some sour cream, cheese, and crackers if you like, but I think it is fabulous on it’s own! Pin This To Save To Your Favorite Recipe Board On Pinterest! First of all, my sweet husband will love this recipe! Second, I love the concept of helping, which is why I still teach. Good for you, and good for Project 7! looks yummy and easy. Thanks for recipe. I liked your mantel too. What a sweet idea…and that soup! YUM! How wonderful Jessica. I make this all the time this time of year. I have never used the roitessere chicken though..genius! I have a diabetic which needs to count carbs, proteins etc. Do you know what the break out per serving is? I’m sure canned beans will be perfect! How funny…I guess that’s just how they come in my store! Can’t wait to hear what you think of the soup! Question for you – do you drain the beans or include the juices from them? Also I am assuming you put the 2 cups of cheese in at the beginning as well. Do you drain the beans before adding to the crock pot? I don’t drain them, Linda. I suppose you could if you like a thicker soup. Hope this helps! 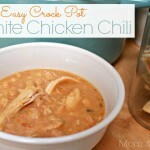 I’ve been looking for a white chicken chili recipe and this one looks delicious! Thanks! Hi! Great northern beans are smaller than pinto beans, and white. You can also buy them in cans. I would use 3-4 cans if you can’t find the actual jar. Good luck! Fixed this with some left over groceries I had. Only had to pick up the beans. It was quick & easy. Cooked on high for 6 hours + added an onion & corn. Thanks! Yummy yummy to my tummy!!! It’s perfect meal for this frigid weather!! I look forward to plopping this in the crockpot and never looking back! Thanks for sharing, Jessica! Is it really supposed to be two CUPS of stock/broth? Doesn’t sound like enough to me and I wonder if it’s a typo. What size is the jar of salsa? My grocery store has several sizes. Thanks!